Which Bible Can We Trust? The TEXTUS RECEPTUS, original Greek text from which the Authorized King James Bible was translated, has been the target of textual critics since 1611. Yet copies of it substantially exist today without error. This is the Bible you can trust. All this talk about older and more dependable manuscripts, like the theory of evolution, hangs upon an UNPROVEN HYPOTHESIS. Any version of the Bible which omits Acts 8:37, or "Through His blood," in Col. 1:14, evidently has for its foundation a corrupted manuscript. This corruption can be traced to 200 A.D., when there lived one of the world's foremost theologians whose name was Origen. Being a TEXTUAL CRITIC, he is supposed to have corrected numerous portions of the sacred manuscripts. Evidence to the contrary shows that he changed them to agree with his own human philosophy of mystical and allegorical ideas. Thus certain original MSS. became corrupt and it is evidently from this source the revised Bibles of this generation have come. Read pages 900-902, Vol. 16, 1936 edition Encyclopedia Britannica and you will see that Origen taught the "LOGOS" is "KTISMA," meaning the Lord Jesus Christ is a created being. Thus, he could easily omit Acts 8:37 and other texts which testify to Christ's deity. Should You Choose The Bible of Your Choice? The Bible is a supernatural gift from God and has been both inspired and preserved by the Holy Spirit. By inspired I mean that the Holy Spirit so moved upon the hearts of men that they recorded the very words that God wanted written in the Holy Bible. The Bible would be no more accurate or authoritative had God written the Scriptures with His own hand. "For the prophecy came not in old time by the will of man; but holy men of God spake as they were moved by the Holy Ghost" (2 Peter 1:21). God has safeguarded the Bible in the past from the wicked poison of human reasoning and He will continue to do so in the future. God is not the author of confusion and therefore He has only inspired and preserved one Bible. "Heaven and earth shall pass away, but my words shall not pass away" (Matthew 24:35). It has been estimated that there are nearly one hundred versions of the Bible available in the English language today. However, this multiplicity of Bibles does not alter the fact that God has inspired and safeguarded one Bible. This one Bible is written in the Greek language in the New Testament and is called the Textus Receptus or Received Text. The Old Testament has been preserved in the Masoretic Text and is written in Hebrew. The Textus Receptus of the New Testament and the Masoretic Text of the Old Testament combine to give us the complete Word of God. The King James Version of the Bible stands alone as the one Bible in use today which has been faithfully translated from these God- given manuscripts. All of the modern versions are based wholly or in part on corrupt texts. Modern translations are not just simply different versions of the King James Bible written in contemporary language. These perversions are different Bibles entirely. Their foundation is not the God-preserved Textus Receptus of the New Testament. Instead, they are based on contaminated, Christ-denying manuscripts which had been rejected by the early church fathers. This turning away from the true Bible to a wicked counterfeit is largely the work of humanistic scholarship. Men who call themselves textual critics have placed their thoughts and ideas above those of God and have presumed to improve upon that one Bible which has been given by God. One can only conclude that they have been so blinded by their compromise and delusions of self-importance that they forget God has already given us His Word. The duty of every believer today is to take the one Bible which God has given and proclaim its glorious message of salvation to a sin-sick world. "I marvel that ye are so soon removed from him that called you into the grace of Christ unto another gospel . . . As we said before, so say I now again, If any man preach any other gospel unto you than that ye have received, let him be accursed" (Galatians 1:6, 9). Almost 2000 years ago men were preaching another gospel no doubt from another Bible. However, never since the Bible was given has it been under such Satanic attack as it is in our generation. Humanistic scholarship has deviated from the Textus Receptus in about 6000 places. This has the same effect as questioning the inerrancy of the Holy Bible in 6000 places. Charles H. Spurgeon stated it very well when he said, "The craving to alter the Word of God is accursed. This is the crime of the present day. The Lord preserve us from it." The Old Testament of the King James Bible was translated from the Masoretic Text. This text was in use during the time of Christ and He quoted from them many times. If the Masoretic Text was acceptable to Christ then it certainly should be accepted by every child of God. This text was kept pure by the Hebrew priests who were given the responsibility of caring for it. The New Testament of the King James Version was translated in 1611 A.D. from the Greek manuscripts known today as the Textus Receptus. The scholars who did this work were giants in their field. They were far superior to the self-proclaimed scholars in Biblical criticism who are responsible for the rash of modern perversions. The Textus Receptus from which the King James Bible was translated is a faithful reproduction of the original manuscripts, which were penned by the writers of the Scriptures. The T.R. or Traditional Text as it is also called has been traced back to the early church. From the birth of Christ to 100 A.D. the original manuscripts were written in the Greek language. The New Testament was compiled by 400 A.D.
by 170 A.D. -- 20 N.T. books had been accepted by the early Christians. by 400 A.D. -- all 27 books of the N.T. had been accepted by the early Christians as they were guided by the Holy Spirit. The Holy Spirit guided so that only the genuine books were included. The Holy Spirit also guided in the selection of the pure manuscripts. The Holy Spirit so guided that false gospels and manuscripts were set aside. the original manuscripts were lost but the Received Text that was produced during this time was a faithful reproduction of the original autographs. 452-1453 A.D. -- The Textus Receptus was used by the Greek Church during this time under the direction of the Holy Spirit. 1516 A.D. -- Erasmus edited the first printing of the Greek N.T. This was in agreement with the Textus Receptus. 1526 A.D. -- Tyndale's New Testament in English was printed. He was burned at the stake in 1536 because he had the Bible printed in English. 1550 A.D. -- Stephens Greek N.T. (Textus Receptus). 1611 A.D. -- The King James or Authorised Version of the Bible was translated from the Greek Textus Receptus in the N.T. and Hebrew Masoretic Text in the O.T. 1611 A.D. -- To the present. Infidels and assorted enemies of the Bible have attacked our Bible in every way known to man, but God's Word shall abide forever. The "other Bibles" which are so prevalent today are as dependable as quicksand. They will vary even from printing to printing as the constantly changing whims of man directs. However, each new Bible will continue down the same path of confusion and error. You cannot produce good fruit from a rotten tree. THE CHRONOLOGY OF THE "OTHER BIBLES"
From the birth of Christ to 400 A.D. False prophets wrote polluted gospels and other books of the Bible at the same time that the true books of the New Testament were being written. Paul makes mention of this in 2 Cor. 2:17, "For we are not as many, which corrupt the Word of God .... "Under the guidance of the Holy Spirit these tainted manuscripts were cast aside and were not included in the Textus Receptus. 331 A.D. Constantine ordered that an "ecumenical Bible" be written that would be accepable to every stripe of Christian that was under his jurisdiction. A man by the name of Eusebius was assigned to direct this undertaking. Eusebius was a follower of Origen who rejected the deity of Christ. He claimed that Christ was a created being. The Jehovah's Witnesses of today believe the same thing. This error is called the Arian heresy. 1481 A.D. The Vatican manuscript was discovered in the Vatican Library. This is a corrupted manuscript which repeatedly casts aside the deity of Christ. It reflects the Arianism of Origen and is thought by some to be one of the surviving manuscripts done be Euscbius at the command of Constantine. The date of its writing coincides with the "ecumenical Bible" of Constantine. 1844 A.D. The Sinaitic manuscript was discovered at Mt. Sinai in the monastery of Saint Catherine. It agrees closely with the Vatican manuscript and minimises the deity of Christ and is Arian in nature. It is safe to suggest that these two manuscripts were two of the fifty that were written for Constantine. 1881 A.D. The Westcott and Hort Greek Text was introduced. This text departed from the Textus Receptus and follows the Vatican and Sinaitic corruptions. Most scholars from every spectrum of Christianity have knowingly or otherwise promoted the Westcott and Hort text from that time to the present. The Jehovah's Witness Bible entitled the "New World Translation of the Scriptures" was translated from the text of Westcott and Hort. Their friendship with Westcott and Hort is not surprising. They reject the deity of Christ and gain strength from this corrupt text. Most, if not all, of the modern translations of the Bible follow the path of the two worst manuscripts which are in existence. They almost seem to loathe the Textus Receptus. This is evidenced by the fact that most Bible colleges, seminaries and schools use some Greek text other than the Textus Receptus. Nevertheless, the new versions are founded on faulty texts and are not acceptable for any purpose. GOD'S BIBLE COMPARED WITH "ANOTHER BIBLE"
In our God-inspired and preserved Bible the meaning of this passage is very clear. Those who have been born again (by receiving Christ) should feed on the Word of God that they might grow in the Christian life. Christian growth has nothing at all to do with initial salvation. Salvation takes place first and then the newborn child of God is to grow. Please note that all of the following new versions leave the door open for a gradual salvation, i.e., one of works. "Be like newborn babies, always thirsty for the pure spiritual milk, so that by drinking it you may grow up and be saved." "And as newborn infants, form a longing for the unadultered milk belonging to the word, that through it you may grow to salvation." The wording may be slightly different in each of these new Bibles, but it should be obvious that they all have the same corrupt source. No amount of polish can correct an untrustworthy text. New World Translation: Verse omitted. The entire verse is in italics. Their explanation for this omission is as follows: "Italics indicate certain familiar words or passages found in the King James Version, but generally omitted now because they are not adequately supported by more recent scholarship." Would any care to hazard a guess as to who the more recent scholars are? The verse is included with the following footnote. "Most ancient manuscripts omit this verse." Since when is 5% of the manuscripts considered a majority? The verse is included (in a manner of speaking) with the following footnote. "This verse is omitted in many manuscripts, some ancient." John 6:69 -- Christ is omitted in 1, 2, 3, 4, 5. Acts 9:20 -- Christ is changed to Jesus in 1, 2, 3, 4, 5, 6. Acts 15:11 -- Christ is omitted in 1, 2, 3, 4, 5, 6. Acts 16:31 -- Christ is omitted in 1, 2, 31 4, 5, (italicised in 6). Romans 1:16 -- Christ omitted in 1, 2, 4, 5, (italicised in 6). Romans 16:24 -- entire verse about Christ emitted in 1, 2, 5, (verse italicised in 6). 1 Cor. 5:4 -- Christ omitted twice in 1, 2, (omitted once in 3), 4, 5, (omitted once and italicised once in 6). 1 Cor. 9:1 -- Christ omitted in 1, 2, 3, 4, 5, 6. 2 Cot. 11:31 -- Christ omitted in 1, 2, 4, 5, (italicised in 6). Eph. 3:14 -- Lord Jesus Christ omitted in 1, 2, 3, 4, 5, (italicised in 6). Col. 1:14 -- blood omitted in 1, 2, 4, 5, (italics in 6). 1 Thess. 2:19 -- Christ omitted in 1, 2, 4, 5, 6. 1 Thess. 3:11 -- Christ omitted in 1, 2, 3, 4, 5, (italics in 6). 1 Timothy 1:1 -- Lord omitted in 1, 2, 4, 5, 6. 1 Timothy 5:21 -- Lord omitted in 1, 2, 4, 5, 6. 2 Timothy 4:1 -- Lord omitted in 1, 2, 3, 4, 5, 6. Titus 1:4 -- Lord omitted in 1, 2, 4, 5, (italics in 6). Hebrews 3:1 -- Christ omitted in 1, 2, 3, 4, 5, 6. 1 John 1:7 -- Christ omitted in 1, 2, 4, 5, (italics in 6). 2 John 3 -- Lord omitted in 1, 2, 3, 4, 5, 6. Rev. l:9b -- Christ omitted in 1, 2, 3, 4, 5, (italics in 6). Verses quoted and emissions listed are by no means exhaustive. They are merely given to show the common bond which exists between all of the new Bibles. They stand or fall together. One cannot accept one and reject another. It should be plain for all to see that Satan's strategy is to lure even God's own people away from the true Bible. Without the inerrant Word of God there would be no salvation. "So then faith cometh by hearing, and hearing by the word of God" (Romans 10:17). I thank God for my salvation and I thank Him for preserving His Written Word for my use and for all who will rest in Him. I am convinced that the King James Bible I hold in my hand is a completely faithful reproduction of the Word of God. I can hold my Bible in my hand and say without fear that I am in possession of the Word of God that has been passed down from generation to generation by the providential protection of my Heavenly Father. The King James Version is the only English Bible in use today which is taken from the Textus Receptus. Therefore, this must be the only Bible used by pastors, Bible students, churches, missionary groups, educational institutions or Christian laymen. In that it is the only authoritative and trustworthy Bible, it should be studied consistently and systematically. Every born-again believer in Jesus Christ should start the day by meditating in the only Word of God and by talking to God in prayer. Every born-again, Bible-believing Christian should endeavor to enlighten others about the dangers of the modern counterfeit Bibles. This must be done if we are to heed the admonition to "earnestly contend for the faith which was once delivered unto the saints" (Jude 3b). God wants you to join with us in sounding the alarm against those who would rob this generation of the only Bible. "The grass withereth, the flower fadeth: but the word of our God shall stand forever" (Isaiah 40:8). All over the world there is an alarming increase in the worship of Satan by outright willful submission to him through occult practices. He is now loosing his forces on the civilized world which has known the Gospel for centuries but which is not presently heeding that Gospel. We may look for an increase in satanic miracles and strange behavior as multitudes resort to witchcraft, astrology, spiritism, and fortune telling. There can be no Christianity without an inspired and authoritative Bible. C. H. Spurgeon once said, "The turning point of the battle between those who hold 'the faith once delivered to the saints' and their opponents, lies in the true and real inspiration of the Holy Scriptures. This is the thermopylae of Christendom. If we have in the Word of God no infallible standard of truth, we are at sea without a compass, and no danger from rough weather without can be equal to the loss within. 'If the foundation be removed, what can the righteous do?' And this is the foundation loss of the worst kind." The Bible is a supernatural Book. It is God's voice speaking, not only in the sense that the Word springs from Him, but from the standpoint also that it is expressed by Him in His own vocabulary. The fundamental claim of the Bible in relation to its inspiration is found in five passages: Luke 1:70, "As He spake by the mouth of His Holy prophets which have been since the world began," 1 Cor. 2:13, "Which things also we speak, not in the words which man's wisdom teacheth, but which the Holy Ghost teacheth." 2 Tim. 3:16, "ALL Scripture is given by inspiration of God." Heb. 1:1-2, "God, who at sundry times and in divers manners spake in time past unto the fathers by the prophets, hath in these last days spoken unto us by His Son." 2 Pet. 1:21, "For the prophecy came not in old time by the will of man: but holy men of God spake as they were moved by the Holy Ghost." It is important in these days of open attack upon the Bible and increased versions of the Bible to make clear what we mean by divine inspiration of the Scriptures. We do not mean what the modernists mean who claim a kind of "human genius" residing in all great writers; nor do we moan as Barth and Brunner and modern neo-orthodox and neo-evangelicals who hold that the Bible is the Word of God because some passages reveal a word from the Lord. This teaching tells us that the Bible contains the Word of God but is not essentially and verbally and wholly the inspired Word of God. While there is open opposition from outside the true Church in lands like Russia against the Word of God and against those who read it, there is also opposition from within religious circles through the modern day versions of the Bible, RSV, Good News for Modern Man, Living Letters, New English Bible, Amplified Version and a host of others. I need not remind you that most of these versions have been prepared by committees whose members reject the infallible inspiration of the Scriptures, the deity of Christ, the blood atonement of Christ, and other essential doctrines. I need not emphasise that many of these versions are ecumenical efforts to unite Protestantism and Romanism into the great whore church of Revelation 13 to 17, the ecumenical church of Antichrist. What is not generally realized, however, is the fact that these revisers are true successors of Jehoiakim, the King of Jerusalem, whose mutilation of Scripture is given in Jeremiah 36:22, 23. A message from the Lord was dictated by Jeremiah to Baruch, son of Nerah, who carefully wrote it in a roll. Jehoiakim came to know of this divine oracle and sent Jehudi to get it and read it to him. As Jehudi read, whatever did not please the king he would cut out with his penknife and cast into the fire, burning on the hearth. Jehoiakim continued with his mutilation of the written Word of God until nothing was left but a heap of smoldering ashes. Surely such a record constitutes a warning not to tamper with the Word of God. Yet many modern versions have used the penknife of liberalism and the penknife of the ecumenical movement to tamper with the inspired, infallible, inerrant Word of God. Yes, but the end is not yet in sight. As modern versions and perversions continue to cut out, rearrange, and change Scripture to suit themselves God's eye is upon it all and His Word shall never pass away. The increasing efforts of men to do away with the Authorised King James Version of the Bible are directed against the authority of the Bible. Under the guise of "better translations," "clearer readings," "church authority," "Christian tradition," "later manuscripts," and "helps for the reader" the corrupters of the Bible with their many perversions have sought to undermine the deity of Christ, the blood atonement, and other doctrines that offend the natural man. You will notice that the modern versions have as their goal the "return to the original Greek texts." The New American Standard Bible, for example, is based on Nestle's Greek New Testament. Nestle's text, as the Westcott and Hort text, is the classical Greek of Alexandrian scholarship, written in Italy. It is not the koine Greek of New Testament scholarship, written in Asia Minor. Nestle's "original Greek" is built on the theory of Vaticanus (the Catholic manuscript which contains the seven corrupt books of the Apocrypha, never recognised by Jesus or Paul, and shows its source of corruption as Rome itself) as the most perfect text. Therefore "going to the Greek" to correct the Authorised King James Version involves running to Romanism to correct a Bible-believing Protestant translation. Even since Adam fell there has been a bias in his descendants to listen to the Devil who repeats today what he said in the Garden of Eden, "Hath God said?" The textual critics of our day, profoundly trained, called higher critics, are also saying, "Hath God said?" The more lofty textual scholars have so falsely put together the knowledge they have gained that our generation now doubts if there is a Bible it can completely trust and say with assurance, "God hath said." The Bible teaches "In the beginning God." This is true of the Bible itself, "All Scripture is given by inspiration of God" (2 Tim. 3:16). As the Spirit of God "moved upon the face of the waters" in the day of creation (Gen. 1:2), so "Holy men of God spake as they were moved by the Holy Spirit" (2 Pet. 1:21). God is the Creator of the universe, the creator of man, and the Author of the Word of God, the Bible. It is possible to know that behind all the marvellous creation of the universe there is a God, a Creator, but let us never forget that the God of creation is also the God of revelation. Paul makes clear in 1 Cor. 2:9-14 that we can only receive and understand this Word as a supernatural revelation (vs. 10), given by supernatural illumination (vs. 11,12,14). God has given us the inspired scriptures for a definite purpose as recorded in 2 Tim. 3:16, 17 so that man could have a sure authority and standard for his reproof and correction and for "furnishing" him for right and good living by a perfect rule. Paul made clear in speaking of the total unity of the Bible which would shortly be completed that "when that which is perfect is come" (1 Cor. 13) that is, the full and completed New Testament, then other temporary aids allowed to the earthly church would "be done away." The early church believers not only "received the word with all readiness of mind," but they gave it the place of final authority, and searched "the scriptures daily, whether those things were so" (Acts 17:11). In their search for truth they did not turn to the evaluations of human reason, nor to the traditions and declarations of the church, but to the written Word of God. The wonder of the Book grows upon us as our experience is enlarged, for the more deeply we search it, the more we feel that the Bible is not merely a book, but The Book. It alone is the universal Book, the eternal Book, the Book for all time. It is the voice of the Lord. It stands alone, unapproachable in its grandeur, as high above all other books as heaven is above earth, or as the Son of God is above the sons of men. One of the first things about this Book that evokes our wonder is the very fact of its existence, for there was never any order given to any man to plan the Bible, nor was there ever any concerted plan on the part of the men who wrote to write the Bible. The way in which the Bible grew is one of the mysteries of our time. Little by little, century after century, it came out in fragments, written by various men, without any concerted arrangement. One wrote a part in Arabia, another in Syria, a third in Palestine, another in Greece and Italy, and the first part was written hundreds of years before the man who wrote the last part was born. Here is a Book that took at least fifteen hundred years to write, spanning sixty generations of this world's history. It enlarges our conceptions of God and gives us new ideas of His infinite patience as He watched the strain, the haste and restlessness of man across the feverish years, while slowly the great Book grew. Here a little, there a little, history, prophecy, poetry and biography, it came forth before a needy world in its finished completeness. There was no pre-arrangement by men. It is not as if Matthew, Mark, Luke and John met in committee and after solemn conference and seeking for the leading of the Spirit, Matthew undertook to write of Christ as the King, and Mark agreed to write of Him as the Servant, Luke undertaking to delineate Him as the Man, and John determining to crown it all by writing of Him as the Son of God. It was not as if Paul and James met and after talking and praying about it agreed that Paul should write of the doctrinal and James of the practical aspects of the Christian faith. There is no trace of such a thing. They simply wrote as they were moved by the Spirit to meet a present need, to teach some glorious truth, to express some earnest longing, and from the aggregation of their writings came this miraculous unit that we call the New Testament. The Bible, though regarded as a Book, is in fact a library of sixty-six volumes written by between thirty and forty different authors, in three languages, on totally different topics and in extraordinarily different circumstances. One wrote history, another biography, one wrote on theology, another poetry, another prophecy, others on philosophy, jurisprudence, genealogy, ethnology, and narratives of wonderful journeys. Here in the Bible we have them all, in a little Book that a child can carry in its little hand. The strangest thing of all is that, although their subjects are so diverse and difficult, and although it was impossible for the man who wrote the first pages to have the slightest knowledge what others would write 1500 years later, yet this collection of writings is not only unified by men in one Book, but so unified by God, the Author, that we can never think of it today as anything else but one Book! And one Book it is indeed -- the miracle of all literary unity. Another marvellous thing about this Book is that it is the only book in the world read by all classes and all sorts of people. Literary people rarely read a child's book, and children do not read books of philosophy and science. There is but one Book that is read by the wisest of men, read to the little child, and read by the old man as he trembles on the brink of another world. Professor Dyson Hague asked the nurse what she was reading to his daughter, and she replied, "I am reading the story of Joseph in the Bible," and the child added, "And please do not stop her, father." She was listening with delighted interest to a story that had been written in Hebrew three thousand five hundred years before. Not far away from the same room where the child was listening, there sat one of the greatest of modern scientists, Sir William Dawson (a humble believer in the Lord Jesus Christ), reading with profound devotion and higher delight the pages of the same marvellous Book. Here is a phenomenon -- one of the ablest of modern scientists delights in reading a Book which is the joy of a little child in the nursery! The Book was not written in the seats of learning, either at Athens in Greece or at Alexandria in Egypt, but in Palestine. Some of the writers were not distinguished for their scholarship. Some did not speak even their own language perfectly. Peter was betrayed by his Galilean dialect, and he and John were described in Acts 4:13 as "ignorant and unlearned men". Many of the men who wrote the Bible were of that character. One was a farm-hand, another a shepherd, others were fishermen. They were men of no literary reputation, and yet by the mysterious power of God the Book has become the standard of language of the most literary nations of the world. The Bible has withstood ages of ferocious and incessant persecution. Century after century men have tried to burn it and to bury it and to extirpate it. Kings of the earth set themselves and rulers of the church have taken counsel together to destroy it. Diocletian the Roman Emperor inaugurated in AD 303 a terrific onslaught upon the Book. Bibles were destroyed, Christians were slain, and the Emperor boasted that the very name of the Christians was blotted out, and yet after a few years, the Bible came forth as Noah from the ark to repeople the earth, and in AD 325 Constantine enthroned the Bible as the Infallible Judge of Truth in the great council of the Church held in that year. Later the Church of Rome denied the Scriptures to the people and for ages the Bible was practically an unknown book. Martin Luther was a grown man when he said that he had never seen a Bible in his life. No jailor ever kept a prisoner closer than the Church of Rome kept the Bible from the people. The worst opposition of all has been during the last two hundred years, with rationalism and modernism seeking to undermine the authority, inspiration and inerrancy of the Holy Scriptures. It was Voltaire's boast that within one hundred years of his death not a Bible would be found save as an antiquarian curiosity. Many more than one hundred years have passed, and other pens and other voices have joined in the attack, but the Bible remains and is being more widely distributed and used than ever before. You need no historical critic for God's own Word. The Holy Spirit, who is the Author of the Book, makes it speak to our souls in such power as to give divine conviction. Men may arise to unsettle and destroy, but the Spirit of Christ comes to validate and confirm, with a certainty that is incommunicable by mere reason, and is impervious to the assaults of doubt. Spurgeon spoke of a poor woman who was challenged by an agnostic to prove that the Bible in her hand was God's Word. She pointed to the sun and said, "Can you prove that there is a sun in the sky?" The unbeliever answered, "Of course, the proof is that it warms me and I see its light." "That is it," she replied, "and the best proof that this Book is the Word of God is that it warms and lights my soul." We do not gild gold. We do not paint rubies. We cannot brighten diamonds. Neither can any artist add any final touch to this finished Word of God. It stands as the sun in the sky and this proud age can add nothing to it. It has the glory of God and any attempt to improve it can but disfigure it. It speaks with authority and breaks upon you as the Voice from heaven. Five hundred times in the Pentateuch, three hundred times in the following books and twelve hundred times in the prophets, the declarations are prefaced or concluded with such expressions as "Hear the Word of the Lord", or "Thus saith the Lord". No other book dares thus to address itself to the universal conscience. No other speaks with such a binding claim or presumes to command the obedience of all mankind. The Book speaks to the inner conscience with the authority of God Himself. Men think of the Bible as a Book that was inspired, and this is true, but it is also true that it still comes sweeping into the hearts of men today, and the same breath of God that gave it life makes it living and spiritually energising today. This is a most remarkable and unique feature of the Bible -- I feel that it is mine. Its promises are mine. The 103rd Psalm is not ancient Hebrew, it is a present day message to my soul. The other day I took up an old Bible that my mother gave me, in which years ago I had marked Genesis 28:15 when I was in great trouble and had to leave my wife and children and travel in quest of health in distant lands. One day as I opened the Bible at random these words came before my eye. Shall I ever forget the flood of comfort that swept over my soul as I read that verse? "Behold, I am with thee, and will keep thee in all places whither thou goest, and will bring thee again to this land." All the critics in the world could never persuade my soul that those words were a mere echo of some far-off relic of a Babylonian legend or oriental myth. No, no! That was a message to me, and it swept into my soul as a voice from heaven and lifted me up. No man will ever shake me out of the conviction that that message was God's own Word to me -- inspiring because inspired. It changes mens' lives and alters their destinies. It inaugurates world-wide movements. A single text transformed Luther and launched the greatest of modern epochs. It comes today into communities of unrighteousness as a regenerating force. The supreme wonder of the Book is Christ, Who is its fulness, its centre, its great subject. Of the whole Book it may be said, "The glory of God does lighten it, and the Lamb is the light thereof". As long as men live upon the face of the globe, the Book that tells of Christ the Revealer, Redeemer, the Risen, Reigning, Returning Lord will draw men's hearts like a magnet, and men will stand by it, and live for it, and die for it. Do not think that we ought to read this Book as we read any other book, or study and analyse it just as we do any text book in literature or science. No! When you come to this Book, come to it with reverence. Read it with a plea for the Spirit's help. "Put off thy shoes from off thy feet, for the place whereon thou standest is holy ground." Other books are of the earth. This is from heaven, it is the living Word of the Living God, Supernatural in origin, divine in authorship, regenerative in power, infallible in authority, personal in application, inspired in its every part. (Summarised and selected from "The Wonder of the Book"
Let us make ourselves very clear where we stand in relation to the Authorised Bible, God's Word. We believe the A.V. Bible was translated by 47 scholars, men of God appointed to carry out this vital work. These men under the inspiration of The Holy Spirit translated from the Greek into English words, placing commas, etc., where necessary, thereby giving us the true meaning in our language. There is no room for alteration to words or commas, etc., as they stand in the A.V. Bible. So vital is this that God has distinctly warned against tampering with His Word. He has placed in our A.V. Bible these warnings. In Deut. 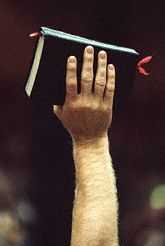 4:2a, "Ye shall not add unto the Word which I command you, neither shall ye diminish ought from it .... "; In Prov. 30:6a, "add thou not unto His Words" and in Rev. 22:18, 19, "(18) For I testify unto every man that heareth the words of the prophecy of this book, If any man shall add unto l hese things, God shall add unto him the plagues that are written in this book: (19) And if any man shall take away from the words of the book of this prophecy, God shall take away his part out of the book of life, and out of the holy city, and from the things which are written in this book." Let us here give one example of tampering with God's Word, and how vital commas are in our English translation. In Heb. 10:12, the A.V. reads, "But this man, after He had offered one sacrifice for sins forever, sat down on the right hand of God;" Some translations have placed the comma after sins making it read "After He had offered one sacrifice for sins, forever sat down on the right hand of God" thus making the return of Our Lord impossible. This of course makes Roman Catholic doctrine, leaving the priests free to celebrate "mass" as often as they please, in spite of Our Lord Jesus Christ having offered one sacrifice for sins forever. Heb. 10:12. We can be sure the A.V. is God's infallible, inerrant, and no less inspired word than was the original Greek and Hebrew from which it was translated. Would God have neglected the preservation of His Pure Word?, if so, He certainly could not hold us responsible. He would have left us without a Bible in which we could place our trust, further more as few of us read and understand Greek, what an impossible position we would find ourselves in, in relation to our salvation. When we are confronted by some new doctrine, etc., we must do as the Bereans did, Acts 17:11. "Search the Scriptures daily, whether these things were so." In addition, we must, under the guidance of The Holy Spirit learn to "rightly divide the Word". 2 Timothy 2:15. We would further draw the attention of those who would seek to alter or improve (as they imagine) the A.V. by using some Greek text which does not agree with the A.V. if so there is only one place for the text, the waste paper basket, as you are probably using one of the many corrupt Greek texts, possibly Westcott and Hort's. This has been altered and differs in something like five or six thousand places from the Received text from which the New Testament of The A.V. Bible was translated into English. We stand or fall on this Bible, God's Word given to us in English. Remember! God wrote only one Bible. Paul said he did not adulterate the Word of God but presented it in all its purity. However, man today has corrupted it by adding to it through the rapid production of new translations, paraphrases, versions, perversions and amplifications of the Scriptures. The best that can be said for them all is that they are helping to increase sales in most Bible Book Stores and helping the publishers to make large profits. The Christians are left without their money and end up in greater confusion than ever. With grateful acknowledgement to our many friends in The Lord Jesus Christ, who, by their prayers and support have enabled us to carry on the fight against the Apostasy in the Churches, and the Masterpiece of Satan, the perversion of The Word of God.